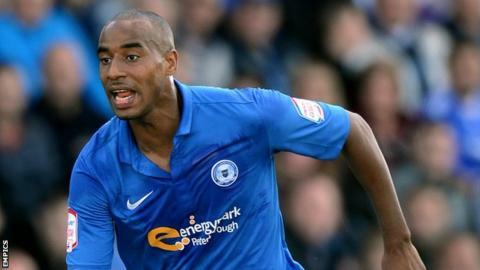 Oxford United have signed Peterborough forward Tyrone Barnett on a 93-day emergency loan. The 28-year-old came close to joining Oxford on deadline day, but the deal fell through. Barnett will provide cover for Will Hoskins, who will be out of action until January because of injury. "I really want to get some football under my belt and have a long run of games and stay injury-free down here," Barnett told BBC Radio Oxford. "It feels good to be wanted by a club. Oxford have a good tradition and are ambitious, my hunger for the game is more than it's ever been and I'm ready to push on. Barnett joined Peterborough for £1.2m in May 2012, but subsequently had loan spells at Ipswich and Bristol City. In November 2012, he said he would be "delighted" if he never returned to the club. Peterborough chairman Darragh MacAnthony said he was "stunned" he did not complete a move to Oxford United on deadline day after a fee was agreed between the two clubs. But Barnett, who began his career at Macclesfield, said the chance of a "more permanent move" elsewhere had prevented him signing. "The only reason it didn't happen was that there was a move for me on a more permanent basis in the pipeline which I wanted to happen. "That did not happen, it was deadline day, so the next opportunity was the loan window." U's manager Michael Appleton is likely to include Barnett for the first time when Oxford travel to Exeter City on Saturday. "Tyrone is a proven goalscorer at this level," Appleton told the Oxford website. "He is a strong lad, has pace and is always going to cause defences problems. We are delighted that he is here and we are really looking forward to working with him."